The new Indie “It Girl” I’ve seen her been called. Kinda like Parker Posey was in the ’90s? 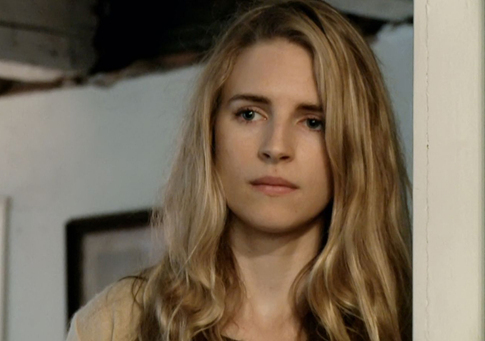 Brit Marling earned the moniker based on a couple award-winning and critically acclaimed indie films from the past year, Another Earth and Sound of My Voice. I’ve seen Another Earth, which is very good. Brit co-stars with the guy who played Ethan, one of the “Others” in Lost. Two planet Earths and the best thing about that – it means two Brit Marlings. Brit Marling as Rhoda in "Another Earth"
Brit proves my part that you can be a really cute gal and look amazing in janitorial clothes. Her other film, Sound of My Voice, I have not seen yet. It probably played in Chicago, ever so briefly, before I caught on to it. And it certainly didn’t play in Northwest Indiana because they don’t allow such films there (you know – interesting, arty indie-type films). Brit plays Maggie, a supposedly time-traveling cult leader – how hot is that? Creepy but beautiful cult leader - where do I sign up? 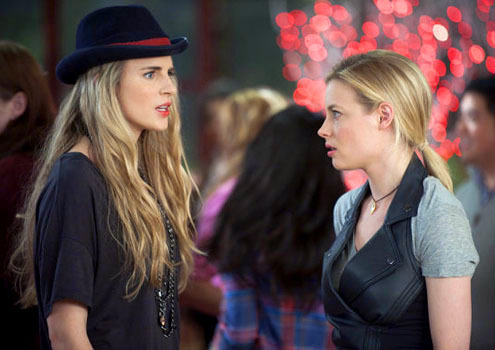 Last, but not least, is Brit’s guest appearance early in ’11 as Britta’s lesbian friend Paige in Community. Need I say more? Brit’s a smart gal (Georgetown graduate – economics) and she’s got talent. Look forward to more Marling in ’12. UPDATE (Feb ’12): Sound of My Voice will be released this April. Watch the first ominous 12 minutes.